Submitted by Denise Azucena on Sep. 26, 2018. First published on Apr. 13, 2018 written by Denise Azucena and last updated on Sep. 26, 2018 by Alexander Briones. With their portability and versatility, MIDI controllers are indispensable tools for songwriting and producing music. The most basic of them let you control computer software sequencers and virtual synthesizers, while some even let you control external sound modules, and have extra pads and knobs for controlling your DAW software. But more importantly, they do all these while shaving off the bulk and extra cost of keyboard instruments. And speaking of cost, here we feature a list of highly rated keyboard controllers that you can get for cheap, with Gearank scores that are based on the user feedback data, including the most recent ones from 2018. If you are looking for your first MIDI controller, or you want a reliable yet affordable backup, this guide is for you. 84 out of 100. Incorporating 1450+ ratings and reviews. This 25 Key USB MIDI controller is designed to be a portable no-frills keyboard controller that just works. The 25-key velocity sensitive keybed is front and center and takes up most of its overall profile to keep its size as small as possible, without making the keys too tiny. There is some space for a few buttons that control octave up and down, tap tempo, arpeggiator and sustain. More importantly, it works plug and play with Mac or PC computers, and runs on USB bus power. Keys: 25 velocity sensitive mini keys with synth action. Buttons: Arpeggiator on/off, Tap tempo, Sustain, Latch (used to change arpegiator notes), Program select, and Octave +/-. Bundled Software: AIR Ignite - editing controls are mapped to the LPK25. Compatibility: Mac OS X + Windows 8, 7 and XP - still in testing for Windows 10 and not yet officially supported. Dimensions: 13.4" x 3.8" x 1.1"
The biggest selling point of the Akai Professional LPK25 is its value for money, with many saying that its quality exceeds their expectations for the price. It also gets a lot of positive comments for its playability, even experienced musicians and music producers have good words for it, describing it as sensitive enough for most uses. There are also a number of users who appreciate its compact profile and portability. There are some who feel that the chassis is a bit flimsy, and there are a few reports of the USB port giving out after some use. Still, all of these are generally avoidable with proper handling. If you're looking for a budget no-frills portable MIDI keyboard controller, then do check out the Akai Professional LPK25. 84 out of 100. Incorporating 150+ ratings and reviews. The microKEY 25 presents a slim and lightweight build that has mini velocity-sensitive keys similar to Korg's microKORG XL and microARRANGER. It includes a built-in joystick for modulation and pitch bend controls, as well as an arpeggiator, sustain and transpose buttons. It can serve as a USB hub with the use of its two USB ports and is very simple to connect to any computing device since it is class compliant. Dimensions: 15.55" x 5.16" x 2.09"
Apart from its simple and compact design, several reviewers commented on how sturdy and well made it is. It's very light-weight that they found it convenient to bring around and easily record their ideas on their laptop. In regards to its keybed, the miniature keys are quite responsive and have a great feel to them, making it ideal for sequencing simple synth lines and drum beats. They also mentioned that it had a great arpeggiator function. Additionally, there were no compatibility issues mentioned since its class-compliant feature allows users to connect effortlessly to any of their computing devices via USB. Although its joystick is quite functional, some reviewers preferred wheels over this type of design for pitch and modulation control. This is a very compact and portable controller with straightforward and uncomplicated operation. 88 out of 100. Incorporating 5+ ratings and reviews. The Midiplus X3 mini has a semi-weighted keybed with 37 keys, which is quite a good when compared to what others are offering. Another cool feature of this MIDI controller is its capacitive touch sensors for that let you control pitch and modulation. It also has four customizable knobs and 6 customizable buttons that you can assign to specific parameters on your virtual instrument or DAW software. Finally, it comes with 1 old school MIDI output for use with MIDI devices. Dimensions: 21.9" x 5.4" x 1.6"
Value for money leads its most commended traits, while coming in at close second is its keybed feel, which many appreciate. Even those who are used to bigger keys have mostly good things to say about its keybed. Quite a few users are also satisfied with its build quality, which exceeded their expectations. There are no noteworthy complaints about the product itself, but there are a few who find the keys to small, and other who complain about the lack of a free USB cable. For those with limited budgets that want an affordable MIDI keyboard with more than 25 keys, do check out the Midiplus X3 mini. 84 out of 100. Incorporating 70+ ratings and reviews. The K-Board from Keith McMillen does not look anything like the average keyboard, it also works quite differently. Underneath each key is a "smart fabric" that detects velocity, pressure and location (tilt), allowing for more expressive realtime control. All three are assignable to parameters like volume, filter, pitch and more, making this keyboard viable for modern electronic music styles. Plaid, Diplo and Jack Conte are just some of the artists who are using the K-board. Dimensions: 12.8" x 3.3" x 0.43"
Many are impressed with the Keith McMillen K-board's modern functionality, especially those who are into modern music. There are also a lot of positive comments about its portability and distinct appearance. Since it does not have a traditional keybed, the feel of rubber keys may take some getting used to. If you're looking for a MIDI Keyboard that plays like a piano, then this is not for you. If you're looking for a versatile and portable electronic music friendly keyboard controller, then check out the Keith McMillen K-Board. The MiniLab MkII is the follow-up version of the original MiniLab with improved and upgraded functions. It offers more than the usual MIDI features, even functioning as a synthesizer when paired with Arturia's own Analog Lab Lite software that has hundreds of quality sounding presets. Its controls include 8 RGB pressure sensitive pads, 16 rotary encoders, and its touch sensors for its pitch bend and modulation control. Dimensions: 14" x 8.7" x 2"
There were several improvements from its predecessor as mentioned in reviews written by both experts and customers. The keys were one of the features that really stood out due to their excellent response and action. As an alternative to wheel controllers, its pitch and modulation strips provided accuracy whenever the values were adjusted. In his KeyboardMag review, Francis Prève mentioned its eight rotary controls have two clickable ones ideal for "toggling synth parameters. This is particularly evident when using the MiniLab Mk II in conjunction with the bundled Analog Lab suite of vintage synths. Granted, it’s the lite version, but even the slimmed down selection of patches hits all of the sweet spots. It includes intelligent macros for customizing your patches, and it sounds wonderful thanks to its basis in Arturia’s topnotch V Collection." In regards to its build quality, it's quite sturdy and well constructed. It's also worth mentioning that users had no problem with setting it up and found the software bundle an excellent bonus. Since it has multiple features and functions, it took a while for some users to figure out the controls. Some of them also found it to be not as intuitive as they would have liked. If you are looking for a portable controller where the value outweighs the price, this is an excellent choice. The Nektar Impact GX49 features transport and navigation controls for you to play, record or navigate without constantly reaching for your mouse or computer keyboard. This controller also has assignable buttons that you can manually integrate with your DAW even if you own software that's not supported by Nektar's DAW Integration. It is also compatible with iOS devices, such as iPads, and can be connected with the use of an Apple camera connection kit. Dimensions: 31.63" x 7.75" x 2.75"
Many keyboardists find the Nektar Impact GX49's overall build and construction to be good. They are also pleased with the touch, feel and velocity response of its keys, as well as its extended range. It has the essential controls that are practical and non-intimidating to those who are new to MIDI controllers. In his MusicRadar review, Dan Goldman mentioned its functions accessed via Setup button "allow custom MIDI set-ups/assignments to be made/ stored if you don't want to use the included DAW templates (your custom settings are stored on power cycle). It's a shame that you can't store more than one custom set-up onboard, but it's all very intuitive." There are some reports of DAW incompatibility, thankfully most of them note that Nektar's customer service is very helpful which led to them eventually getting the issues resolved. This is a well-built and simple controller that makes your workflow more productive. The Impact LX25+ features Nekta's DAW integration where it intelligently maps its controls to the corresponding parameters and controls of several commonly used DAWs, such as Digital Performer, FL Studio, GarageBand, and Logic Pro. It has full-sized velocity sensitive keys with 4 velocity curves and an option to choose one of the 3 fixed velocity levels for a more consistent performance. It also has the essential controls such as pitch and modulation wheels, knobs, 30mm fader, and velocity sensitive pads. Living up to its integration feature, this controller is reported to work well with any compatible DAW. Since it is also class compliant, a number of users mentioned that they have no issues with setting up. Many also commend its hardware quality, stating that the knobs and pads are quite tactile and sturdy. The rest of the controls are intuitively and strategically laid out, while its full-sized keys also make it comfortable to play since there's more space for your fingers. A few users find the keys to be a bit stiff and springy, which isn't really an issue when it comes to playing and recording synth lines. At a fair price range, this is a great controller for a simple home recording set-up. The Novation Launchkey Mini is a compact controller designed for Ableton Live, with 16 backlit velocity-sensitive drum pads that are mapped to the popular DAW software's session view and can be used for triggering loops, beats and launch samples. 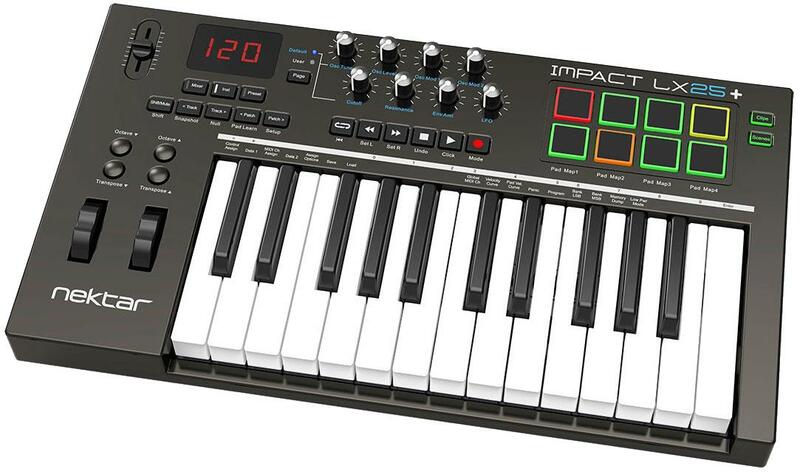 Additionally, it has eight knobs that allow you to tweak, or assign, parameters and effects. Since it's class compliant, it offers plug-and play compatibility with most operating systems. With the right amount of features, including its pads, knobs, and buttons, this controller provides a lot of value for its size, which is very portable. Dimensions:12.79" x 6.89" x 1.69"
Many users are delighted that it provides a more hands-on experience whenever they compose or play music. They also find the bundled software synths to be a great addition to sequencing electronic music. Some users find its plastic keys to be pretty stiff and a bit springy. Some also caution that its miniature keys take a while to get used to. This is an excellent portable controller for beginners and performers who want a reliable yet cheap backup controller for on-the-go gigs. There are several factors to consider when looking for a keyboard controller, and the first one would be its key size. If you are simply looking for something portable to lay down your ideas, a keyboard controller with smaller keys and build is an ideal choice, thankfully there are quite a variety of them in the entry level market. If you plan to compose for a final project or play live, then you'll probably have to extend your budget to get ones with more features and full-sized keys. The number and type of keys that you need will also depend on your playing style, as well as the space you're planning to use the controller. If you are used to using two hands, a 37 or 49-key MIDI controller would suffice. 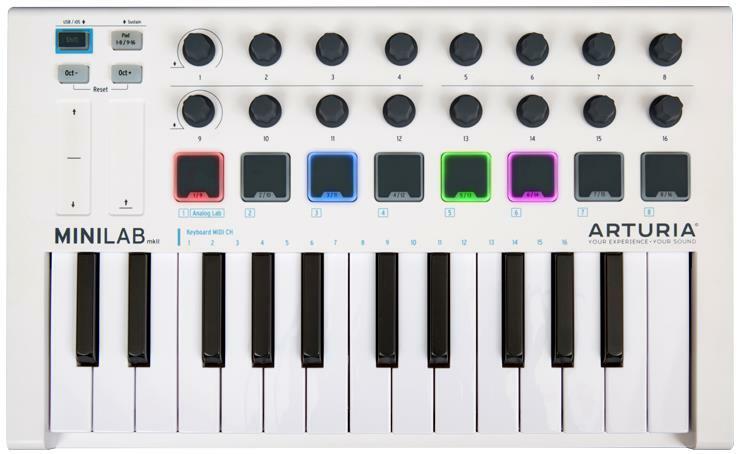 A 25-key MIDI controller is good enough if you plan on using them for playing or recording lead, bass and drum lines. Additionally, they are more compact and lightweight which makes them portable enough to bring around. Since you are on a budget, most keyboard controllers under a $100 price range come with semi-weighted keys where the keys have less resistance. As long as they have velocity response, they will provide you a more natural performance. MIDI mapping can be a tedious task whenever you set up your controller, but technology has made this easier with better compatibility and detection and automatic mapping. Another important point to consider is that some keyboard controllers are designed to integrate better with a specific DAW. Thankfully, these DAW specific controllers are also designed to work with other DAWs, albeit with some configuration work required. Most controllers are designed to let you customize your own MIDI mapping by re-assigning controls at your convenience and preference. These buttons are used for triggering essential DAW controls like record, pause and play on your keyboard. Since they transmit MIDI data to your DAW, they give you the same level of control without having to reach for your computer keyboard, touchpad, touchscreen or mouse. In addition to transport controls, most MIDI keyboards have extra handy controls, such as knobs, modulation and pitch wheels, and sometimes faders. They can be assigned or automatically mapped to give you more options when it comes to mixing or editing parameters in your DAW. An example of this would be assigning a knob to tweak a synth’s filter. This is very handy when it comes to composing or editing real-time for live performances. Most MIDI keyboard controllers come with USB connectivity, which allows you to connect your controller to a PC, Mac or any other computing device. This is sort of a concern when it comes to draining your device's battery more quickly unless your device is plugged into a power source. It’s more of a concern with iPads, which provide 100mA instead of the common 500mA found in a USB 2.0 slot. In this case, a USB hub or an external power adapter is used to supply power directly to your controller. Some MIDI controllers still come with at least one 5-Pin MIDI input and one output. These are useful if you have any vintage equipment that you want to control with a modern MIDI keyboard. Most MIDI keyboards come USB slots since they are compatible with most devices. As mentioned above, the advantage of USB is that it can draw power from a PC or Mac when connected, compared to 5-Pin MIDI slots where you need a power supply. In some cases, some controllers have both connectors. Unless you are going to control hardware directly, without a computer in the loop, then you won't need a 5-Pin MIDI out. We began by seeking out the most highly rated MIDI keyboard controllers with street prices below $100, taking into to consideration the latest reviews up to the 3rd quarter of 2018. For this update, we still limit our scope to those that are available from American online retailers, and we ended up gathering over 6,700 reviews, ratings and recommendations from actual users and experts. All these data were processed via the Gearank Algorithm to produce a rating out of 100 for each, the result of which were used to narrow down the list to the deserving few. For more information about our methods please read How Gearank Works. The following keyboard has been removed from the recommended list above due to a price increase which made it ineligible for inclusion: Korg microKEY2 37. This is great but I wish you would do a best under $300 article, preferably only with 61 or more keys for those of us who are not just guitar players looking to trigger a few loops and very limited samples or riff, i.e truly "play." 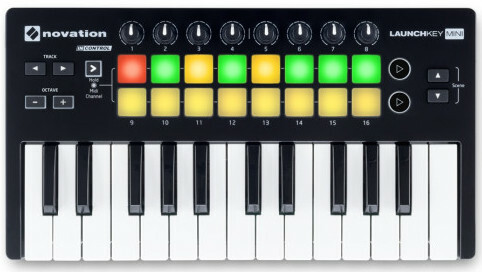 We do have this on a different guide: Best 61 Key MIDI Controllers Under $300.